It is not difficult to understand that it has to be something special about Maxime Mengue, the central defender of Canon de Yaoundé, currently number four in the Cameroonian MTN Elite One 2010-2011. The current season is actually the first season of Mengue at the highest club level of Cameroonian football and it is fair to say that the youngster has been a true revelation. Mengue is born 14.04.1992 and was apparently signed from Tonnerre Kalara Club of Yaoundé, a second level club playing in the MTN Elite Two. Although inexperienced, Mengue used only a few matches to establish himself as a key member of the Canon de Yaoundé defence, where he is forming a brilliant partnership with captain Robert Ntolla Nguena (born 16.04.1985). Mengue plays with a maturity way beyond his years and already shows leadership qualities. The legendary Javier Clemente is the current manager of the Cameroon national football team and in December 2010, he invited several local players for training sessions, including Maxime Mengue. At this point, Mengue had played 6-7 matches in the MTN Elite One. 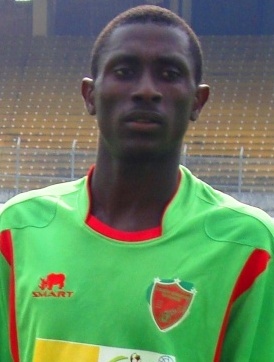 Several local newspapers reported that “the young, talented central defender of Canon de Yaoundé” was one of the players that impressed Clemente during the training session. Earlier this month, Mengue was included in the squad of the Cameroon U-20 national football team. Cameroon U-20 is preparing for the “Orange African Youth Championship” that will be played in Libya in March / April 2011 and Mengue will most likely be a key member of the Cameroonian team. The championship will be bustling with scouts and my guess is that Mengue soon will be on the radar of several European clubs. The picture is taken from Le Chabba.